I enjoy beginning each post with a little snippet, an anecdote, a snap shot of things from our everyday lives, and our experiences. It’s cathartic, and fun to share- especially with our readers who’ve been following along with us and our story for any length of time. Today though, I don’t seem to have anything much to share with you guys; I’m sorry. I mean, life around here’s been pretty average- which isn’t a bad thing. Kids are healthy, happy. Unusually well behaved. Good grades. Steady work and busy schedules for us all. Pretty normal stuff, right? I’ll let you in on a little secret though, some pretty big changes are right around the corner. My husband and I have been together for over a decade now (hard to fathom), and this March we will celebrate 9 years of wedded bliss. Not all of them hot and spicy- it’s marriage folks, sometimes it’s hard. But I can say we’ve always kept it saucy! While we don’t always see eye to eye, we do try to give each other the benefit of the doubt in life. One of those, was when we trusted each other and our resolve that trying for a house to call a home wasn’t the right decision for us when we first got married. We had some ducks to get in a row first. So here we are, approaching our 9th anniversary, and having lived our entire married life in an apartment. Granted at 1300 sq. ft., it was a very spacious apartment, but … it’s still an apartment. We’ve paid our dues, we’ve dotted our i’s, crossed our t’s, and after a great run (and some advantages to apartment living)- we’re done with the apartment life. So, in addition to sharing this with you just because I’m bursting at the seams with nervous excitement, my motivation is two-fold. I’d also like to apologize in advance if our posting schedule gets erratic, or if it takes us longer to get back to your comments or questions- please bare with us! I promise it won’t take long for us to return to our regularly scheduled program. And it’s not until April, so we’ve got a while yet before we worry! Ok, now that the cat’s out of the bag and all that- it’s time to C-E-L-E-B-R-A-T-E!! I don’t know about you, but all of our celebrations involve food. Not just any food either. Good, solid comfort food, and typically a fair amount of cheese. What better way to check off all those boxes than with some tex mex fare worthy of any fiesta? 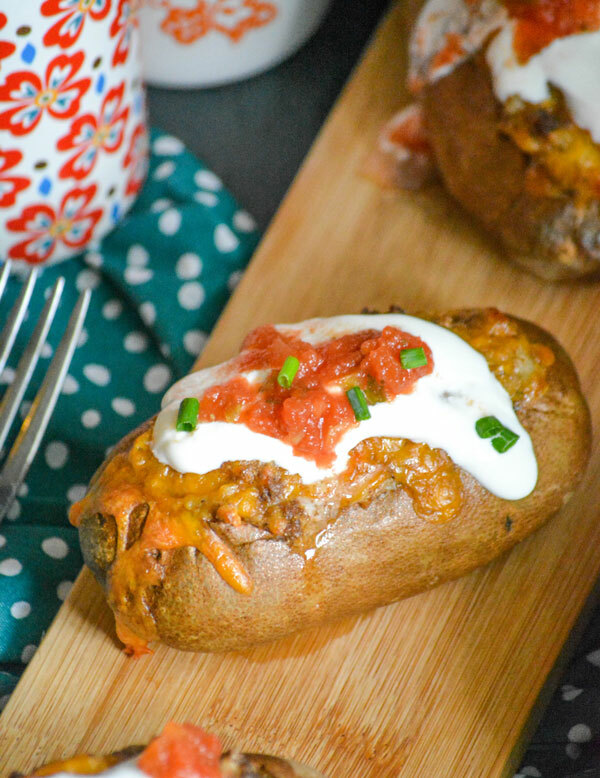 Good thing these Twice Baked Tex Mex Taco Potatoes are all of the above, and then some! 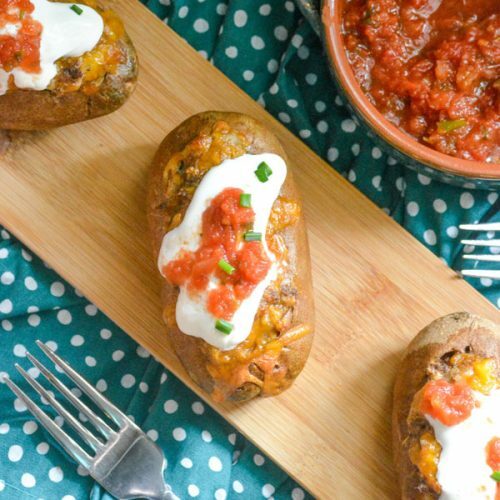 Crisp potato skins are stuffed with a seasoned meat & cheesy Tex Mex mashed potato mixture before being toppedwith more cheese, baked to golden brown perfection and loaded with your favorite Mexican fixin’s. It’s milestone comfort food worth celebrating, or celebrating with. 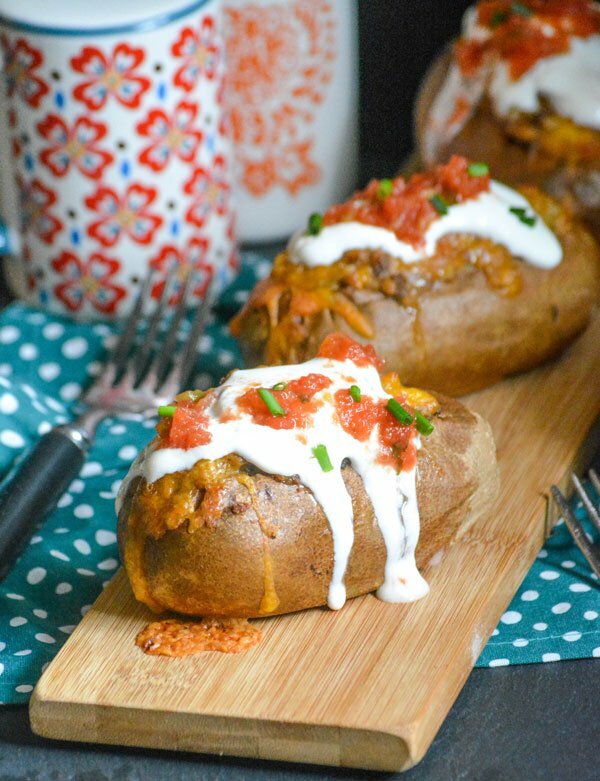 Cheesy, meat stuffed twice baked potatoes are loaded with your favorite taco flavors for the ultimate Tex Mex comfort food. Scrub the potatoes until clean. Prick them evenly all over the surface with a fork. Place them on a baking sheet and bake at 475 degrees for an hour, or until soft. Depending on your oven and altitude, it could take longer. White the potatoes are cooking, add the beef & onion to a large skillet and saute-stirring and breaking up- over medium heat until the beef's cooked through. Strain, and return to the skillet. Stir the taco seasoning and water into the meat until evenly incorporated. Continuing cooking over medium heat, just until the sauce has thickened. Remove from heat, set aside. Remove the cooked, soft potatoes from the oven. Transfer them to wire racks and let them cool for about 15 minutes. Use a paring knife to remove just the top bit of skin from the potato, creating a 'lid'. Using a spoon, scoop the soft flesh out of the center of the potato, and transfer to a large mixing bowl, to create a bowl. Scoop out as much as you can, just leaving a thin layer intact to prevent leakage. Repeat for all potatoes. 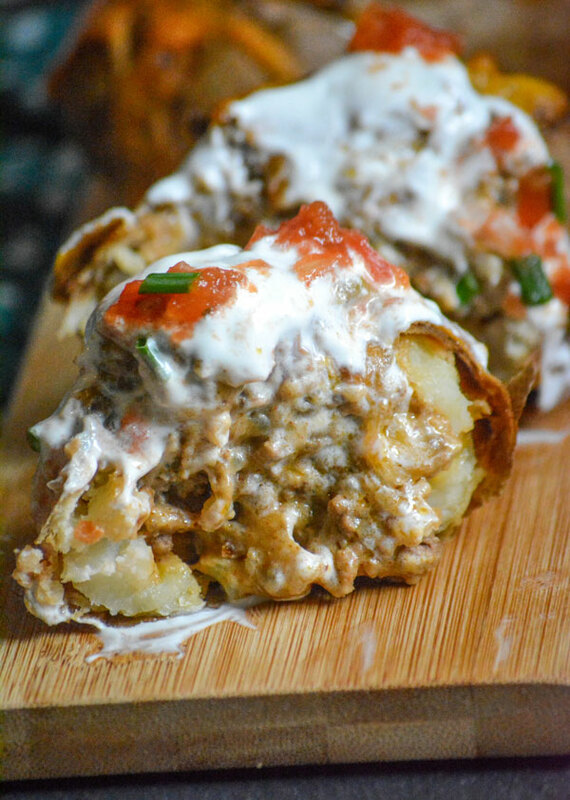 Add the sour cream, half & half, taco meat mixture, and 3/4 cup of cheese to the mixing bowl. Stir/mash everything together until the mixture's smooth and evenly incorporated. Salt & pepper, to taste. Scoop the mixture back into the hollowed out potatoes, evenly, until they're all completely stuffed. It's ok if it goes above the rim, and also ok if you need to pack them down some to fit it all. 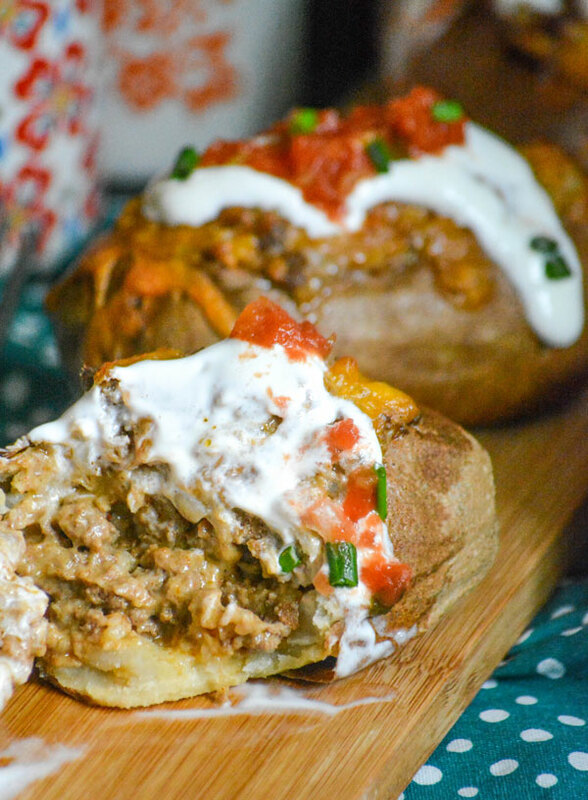 Return the stuffed potatoes to the baking sheet. Sprinkle the remaining 1/4 cup of cheese evenly out over top of the potatoes. Bake at 375 degrees for 15-20 minutes, watching so the cheese melts and crisps but doesn't burn. Remove the potatoes from the oven, again transferring them to cooling racks, and let them cook for 5-10 minutes. 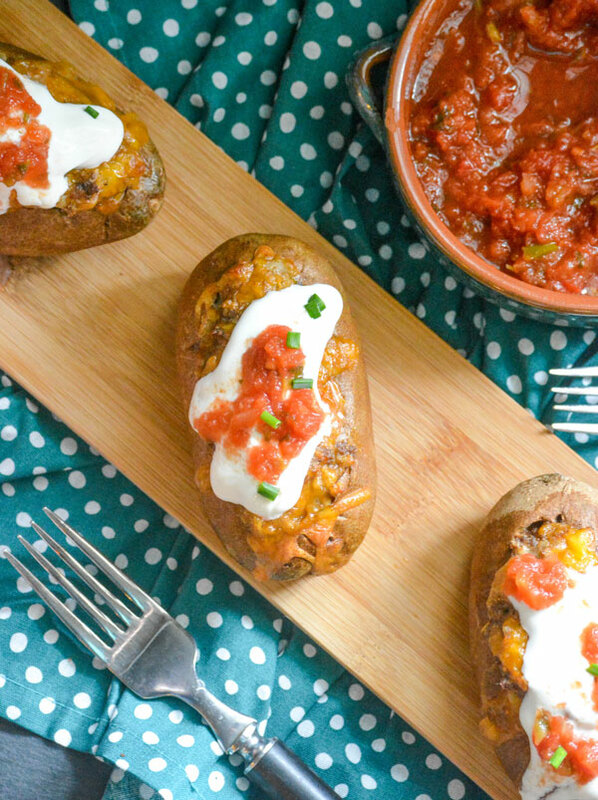 To serve, top them with a dollop of sour cream, salsa, and a sprinkle of green onion. Tex Mex anything is always a hit at our house. 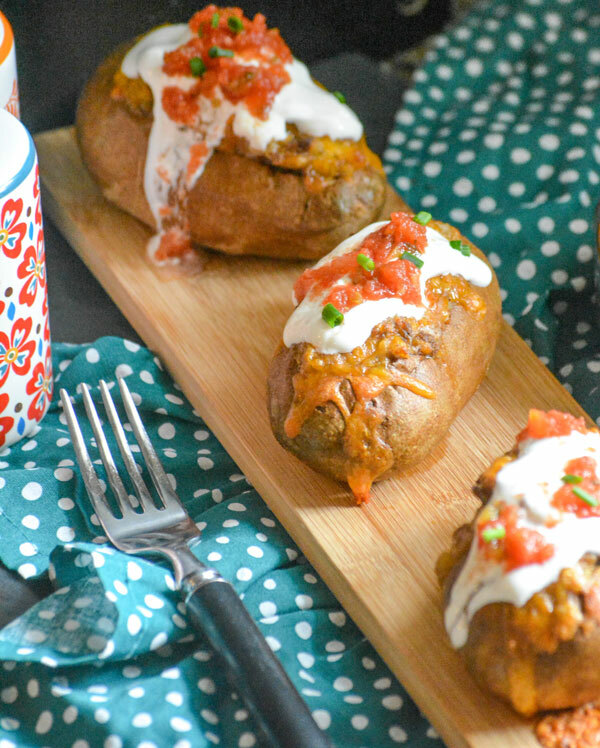 I love how packed with goodies these bakes potatoes are. Thanks again for sharing at FF! Who knew a simple potato could hold so much? !